Ten writers are selected for a summer-long writing retreat with the most celebrated and reclusive author in the world. Their host is the legendary Roderick Wells. Handsome, enigmatic, and fiendishly talented, Wells promises to teach his pupils about writing, about magic, about the untapped potential that each of them possesses. Most of all, he plans to teach them about the darkness in their hearts. The writers think they are signing up for a chance at riches and literary prestige. But they are really entering the twisted imagination of a deranged genius, a lethal contest pitting them against one another in a struggle for their sanity and their lives. Wells’ mansion looked like every ghost story he’d ever read. As they drew closer, Rick couldn’t shake the feeling he was about to become part of one. I’ve read and reviewed many of Jonathan Janz’s releases and re-releases over the last several months, and have loved all of them, but none have won me over quite as much as my first read of his, The Siren and the Specter—that is, until finishing this newest novel of Jonathan’s, The Dark Game. I know what haunts you, Wells gloated. I can summon it here to claim you. Right off the bat, this synopsis ticked so many boxes for me. I love books about writers, I love plots involving competitions, and I love “retreat” settings (camps, secluded mansions, etc.). Most of all, I love when a horror story features multiple characters plagued by their own personal demons—but it’s not an easy trick to pull off, because telling these layered stories-within-a-story requires a nuanced and talented creator. Luckily, Jonathan Janz is precisely that. As is typically the case with one of Jonathan’s stories, there’s a wide and varied cast of characters, but I didn’t find myself losing track of who’s who or disliking the number of perspectives; if anything, it was so intriguing to watch the story-telling style change as the players began to exit the game. And boy, do they ever exit quickly; The Dark Game’s action picks up early and never lets up. I learned something that night. I learned that stories have incredible power. They can teach. They can transport. But they can also bring misery. They can enslave. Some stories can kill. 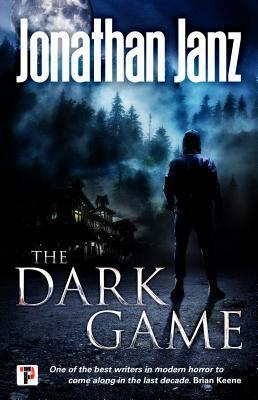 Up until now, I’ve always recommended that readers who are unfamiliar with Jonathan Janz titles begin with Siren, but after finishing up this incredible whirlwind of nightmarish suspense, you can’t go wrong with The Dark Game as an introduction to his work, either. I know this is going to be a new all-time favorite that I’ll be raving about for a long time to come, and I can’t wait to see what Jonathan does next to top it. It’s funny because this one was my introduction to Jonathan Janz work and I’m so glad it was! I really liked this book and I’m still in awe with how he was able to create and develop so many interesting characters in such a horror setting. That’s awesome! I’m so glad you enjoyed it! 😀 He’s so talented and I really hope you like whatever you read next by him.